If you've been reading me lately I've got some good news on the roommate front! Chuck picked up keys to the house this week and will begin moving boxes over this weekend with his final "big move-in" coming sometime next week. To say I'm stoked is an understatement—I've been trying to land a roommate since August of last year and things have been really difficult going it alone. And this is pretty much an ideal situation—Chuck is a gamer and he's been itching to get back into Magic. So not only will having a roommate let me reclaim more free time to play and even travel a little bit for Magic but I'm going to have someone in my house I can duel against and playtest with! I consider myself a decent Magic player with pretty good instincts but when I sit down to actually play games I can really tell the rust has set in. Writing about Magic and theorizing about Magic only carry you so far—actual playing is where you develop that muscle memory that is crucial to tournament success. For those of you who enjoy reading about my tournament play and competitive decks I expect the quality of both to dramatically improve in the coming months! For those of you who enjoy the casual side of Magic I expect to have more stories on that front as well—Chuck is much like me: he enjoys casual multiplayer Magic as much as he enjoys dueling so he's very interested in learning Commander. Since I typically have several Commander decks built at any time it should be pretty easy to get him up to speed quickly. This gives me the perfect lead-in to the topic at hand…Commander starter kits! I've gotten some feedback that the EDH Starter Kits columns (Allied colors Enemy colors) I wrote back in 2010 were something a lot of people have used to help jump-start friends into the format. It seems like the next step would be presenting five three-color starter kits for those new players who want to get a bit more color-intensive. Wizards has done a great job of making a lot of solid mana fixing for casual players without requiring heavy investment in high-dollar rares so I think we can move to three colors and still remain budget-friendly. I'm going to stick with the three allied-color "shards" to build off the great cards available from Shards of Alara block. The goal for each of these starter kits is to suggest a commander and some staples that will get you well on the way to having a viable Commander deck for $25 with just 20-30 more cards needed to finish up the deck. First up I'll start with cards that go into any starter kit. Commander is all about having fun and you can't have fun if you can't play your cards so you need mana fixing mana acceleration and card drawing to keep the gas coming. While there are tons of really good—and relatively expensive—mana fixers out there you don't have to break the bank to do it especially in Commander where the pace is a little more laid back. When you're just getting started these cards will be perfectly fine but you'll also find as your collection grows many of these cards will still make the cut. Just because they're cheap doesn't mean they aren't still really good multiplayer cards. On the utility artifacts I chose these cards to cover a variety of bases. Crystal Ball is nearly as great as Sensei's Divining Top for a fraction of the cost and I've got a copy in many of my Commander decks. Sun Droplet is a great deterrent to wave away people attacking you with random dorks and the more opponents you have the better it becomes. It's not strictly life gaining but it helps keep your life totals from plummeting too fast. Illuminated Folio and Urza's Blueprints have a relatively hefty initial mana investment but the activation cost is dirt-cheap which is what you want in your reusable card draw. Sharp-eyed long-time readers might notice that this universal package is a bit different than the one I pulled together for the previous articles. I reexamined the prices and a couple things I recommended before had gotten more expensive in the past couple years (Power Matrix and Journeyer's Kite for example). I also cut some of the colorless mana accelerators in favor of colored mana producers since a three-color deck is going to have more colored mana demands. Lastly there've been some more Magic sets to come out since I wrote those articles and they include some Commander "must haves" too. Sek'Kuar doesn't get much love or respect around the Commander table so he makes the perfect beginner Commander—no one will really get paranoid about you playing him until you start doing all sorts of fun and nasty things with him! Sek'Kuar is particularly nice with effects that sacrifice creatures since you get the effect plus you get a bonus 3/1 creature to go along with it. There are a ton of great cards in green black and red that sacrifice creatures for profit so as you round out your deck keep an eye out for them. Don't forget to include some ways to get back creatures from the graveyard (I've included Charnelhoard Wurm and Deadwood Treefolk). Undying Evil lets you buy back a creature that's died and at instant speed you can surprise people with it. Breath of Fury is an interesting card to try out here; with Sek'Kuar in play each time you sacrifice a non-token creature to get another attack step you get a bonus 3/1 token creature with haste than can join in on the attack. If someone leaves themselves vulnerable to an attack you can really punish them for it! All you need are 22 more non-land cards to round out the deck and you're ready to go! Add in some removal spells some card drawing and some heavy-hitting creatures like Lord of Extinction. I'd also look to mix in some graveyard recursion like Living Death or Oversold Cemetery. Sol'kanar is definitely one of the coolest looking legends ever printed and he's actually quite efficiently costed given his size and deceptively good abilities. When picking cards for your Sol'kanar deck you definitely want to lean towards black spells to trigger that incremental life gain as often as possible. I've also included Vedalken Plotter so that you can donate a Swamp to someone for Sol'kanar to Swampwalk on…maybe in exchange for his Maze of Ith? Black actually has a lot of ways to change an opponent's lands into Swamps but I picked Tainted Well because it replaces itself; try and use it on someone's powerful land card to neutralize it with benefits. Whim of Volrath is a handy card that in a pinch can change Sol'kanar's Swampwalking to say Forestwalking. Evincar's Justice is a nice black spell with buyback letting you sweep the board of weenies while gaining you life from Sol'kanar. All you need are 24 more non-land cards to round out the deck and you're ready to go! 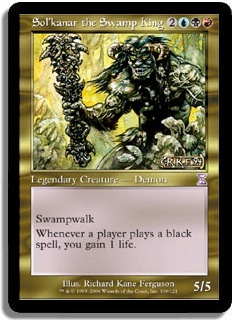 Black has lots of ways to turn life into cards (Greed Skeletal Scrying) so keep an eye out for those sorts of cards. You might also want to look at some defensive cards like Propaganda to hold the fort while Sol'kanar is bringing the pain on your opponents' life totals. 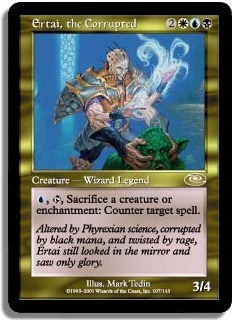 Fair warning: Ertai the Corrupted is a very annoying Commander to play against—having a repeatable counterspell effect can really aggravate your opponents so be prepared to have people come after you. That said if you gravitate towards this color combination this is probably the exact kind of deck you'd be interested in! Mixed in with the good solid utility creatures are some ways to protect Ertai in the form of the Flagbearer creatures Coalition Honor Guard and Standard Bearer. People are going to want to kill Ertai and if they can get past his counterspell ability they'll have to kill a Flagbearer first. Some spells that can create fodder for sacrifice will certainly help keep Ertai frisky. I've also included the Elixir of Immortality and Trinket Mage combination to keep your library and life totals well stocked. All you need are 23 more non-land cards to round out the deck and you're ready to go! If you can dig up a Spellskite to further protect Ertai it would probably be very helpful along with more ways to create tokens for sacrifice (Bitterblossom). If you want to get really ugly with Ertai add some cards like Arcane Laboratory Rule of Law and Curse of Exhaustion. 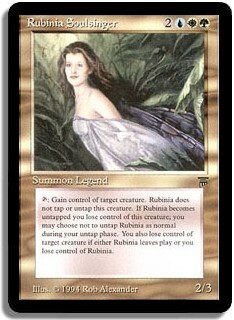 Rubinia offers a powerful effect—the ability to steal a creature just by tapping. This color combination also offers up a ton of really good Commander staples that will serve you well in all sorts of decks. Much like Ertai Rubinia will likely aggravate your opponents who will justifiably try and destroy her so I've included Flagbearers here too as well as Shaman en-Kor (who can help redirect any damage dealt to Rubinia). You can also do things like steal a creature with Rubinia and then redirect damage to that creature through the Shaman's ability. A friendlier approach to using Rubinia is to "borrow" creatures to help clear the way for things like Ophidian to make it through unmolested. On the flip side a less friendly approach is using Rubinia to feed sacrifice effects like Claws of Gix. Trinket Mage can help you find the Claws or you can also restock with Elixir. All you need are 24 more non-land cards to round out the deck and you're ready to go! Thousand-Year Elixir would be very helpful in letting you use Rubinia right off the bat and multiple times. Try and trade for some of Bant's exalted stuff (Rafiq of the Many Finest Hour) since taking someone's creature with Rubinia and then sending it buffed up with exalted at someone else can be quite fun! 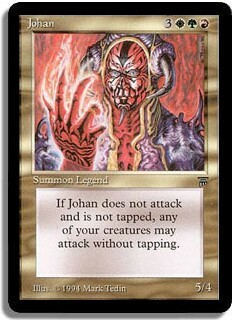 Doing the Mana Pool podcast a few weeks back reminded me of how cool Johan is and he's still really cheap to buy! Another great-looking card from Legends. Johan gives your attacking creatures vigilance of sorts so having creatures that tap to do stuff is quite handy. I thought that going with a metalcraft/Myr theme in Naya colors would be fun with Johan particularly with Myr Battlesphere. Jor Kadeen in particular can quickly turn your cute little Myr into something ferocious! Aura Shards isn't an artifact and is a little pricey but it's too good not to find room for no matter how tight your budget is. All you need are 22 more non-land cards to round out the deck and you're ready to go! You obviously really want Myr Matrix in this deck but it's a bit pricey so I didn't include it in the starter kit. You can probably trade for one relatively easily. You'll want to include a few more pieces of equipment to boost your little guys and take advantage of Brass Squire's ability along with cards like Stonehewer Giant that can search out the equipment. That's it for this week! If you have any further budget ideas for starter kit cards please share in the comments below.